Fringe tree reaches 8-25 feet in height; the leaves are opposite, smooth, and oblong to oval in shape, grow 8 inches long. In May and June, when the leaves are only partially developed, the fragrant, slender-petaled, white flowers, from whose fringe-like petals the tree derives its name, appear in dense, drooping, panicles. The fruit is an oval, purple drupe, resemble small olives. Other varieties: Leaves of the Chinese species (C. retusus) have been used in Asia as a tea substitute. Grows in the middle and southern United States and in New England. Cultivated in parks and gardens, dry slopes, and occurs wild along riverbanks and on higher ground. New Jersey to Florida; Texas, eastern Oklahoma, north to Missouri, southern Ohio. 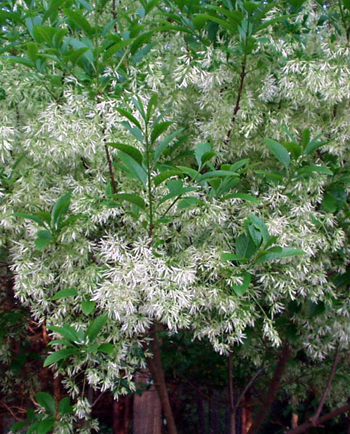 Native Americans and early colonists were familiar with fringe tree’s healing virtues. Migraine sufferers were amazed at the results of treatment. Bark tea reduces fevers, relieves dyspepsia, and is beneficial for kidneys and liver inflammations including liver cirrhosis, acts as a cathartic, jaundice, gallstones, stimulates bile secretion, treats hepatitis, colic, headache, migraines, malaria, and used as a tonic. The bark made into a poultice is used externally on wounds, sores, infections, and skin irritations. Decoction: boil 1 tsp. bark in 1 cup water. Take 1 cup per day. Tincture: take 7-10 drops in water, as indicated. Physicians formerly used 10 drops every 3 hours, of tincture for jaundice. Prepare tincture: 1 part bark by weight in 5 parts 50% grain alcohol (not rubbing alcohol which is poisonous if taken internally) and water. Overdose may cause vomiting, frontal headaches, slow pulse.